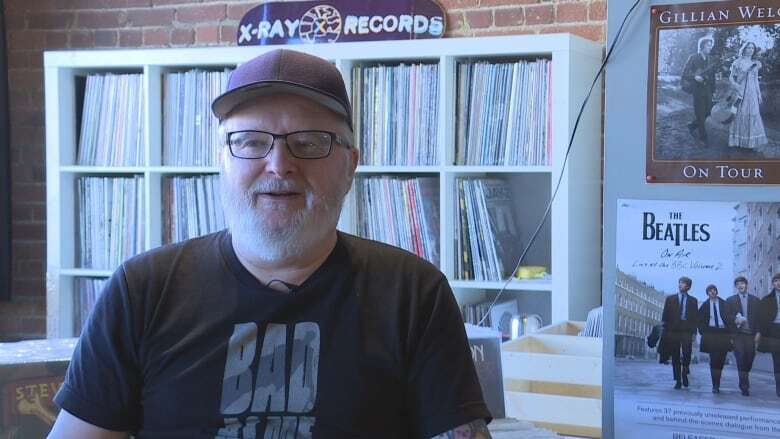 From vinyl and cassettes to CDs and back to vinyl, the medium of choice for music lovers has turned full circle since Dave Kuzenko opened his Regina record store in 1987. With Record Store Day putting the spotlight on stores like X-Ray Records on April 22, Kuzenko took some time to reflect on why records are still spinning in a digital world. "They're fun to look at, they're fun to play, they have a different sound [than] we always hear from the CD sound; the warmth of the vinyl," said Kuzenko. "You're more involved when you're listening to records than you are just kind of banging out stuff on your computer or your phone or whatever." CDs were just starting to make their way into Saskatchewan homes when Kuzenko opened his first record store, Records on Wheels, in the Scarth Street Mall three decades ago. By 2004, when he moved to 11th Avenue, the compact disc was dominating music sales to the point that only a small bin of records remained in Kuzenko's store. Sunrise Records taking over 4 HMV locations in Sask. That's when the popularity of vinyl started to turn around. "It really has been that far back now, like 2004, 13 years ago," said Kuzenko. "People seem to think that it's just been some kind of overnight sensation for vinyl to be back again but, you know, it's been growing steadily for over 10 years now." Kuzenko said many of his clients are collectors and "gearheads", drawn to the hobby of finding the perfect sound through their amps, speakers and turntables. Some are enamoured by the artwork on the album covers, and others like to throw parties around the turntable. According to Kuzenko, their musical tastes are as varied as their ages. "You'll see teenagers, 14, 15-year-olds getting into records," he said. "The same as you're still going to see, like, the 60-65-year-old guy who's been into them his entire life, still flipping through the bins." Record Store Day — an annual international event celebrating independent record stores — brings a bigger crowd to his Regina store, and others across Saskatchewan, to track down the limited edition and exclusive records released every April. "It brings everything into focus for people as to why little record stores continue to exist and why we continue to do this kind of thing," said Kuzenko. According to the Record Store Day website, X-Ray is the only participating Regina store. McNally Robinson Booksellers, The Vinyl Exchange and Vinyl Diner are all participating in Saskatoon.